Ages 4 through 8. 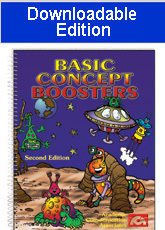 The revised edition of this popular book includes new pictures, worksheets, games, and activities to teach the concepts most often used in classroom directions. Concepts emphasized include on/under, forward/backward, above/below, through/around, whole/half, together/separated, wide/narrow, same/different, more/less, inside/outside, top/bottom, near/far, in front/behind, and many others. The worksheet activities can be administered by classroom teachers, speech-language pathologists, or by parents. The individual lessons include the following. Concept Contrast Pictures. The first page of each lesson includes a separate picture for each of the target concepts. The contrast on/under, for example, is represented in two pictures. Concept Identification Worksheets. Students are asked to point to the picture that matches a sentence read by the examiner. Listen and Draw Worksheets. Students are asked to respond to instructions such as, "Find the snake that is under the tree and color it red." Students are also asked to describe the pictures and/or to tell stories about them. An Assessment Checklist, Informal Concept Assessment Probe, Reproducible Spatial Concept Picture Scenes, and other resources are also included in this practical, easy-to-use resource.